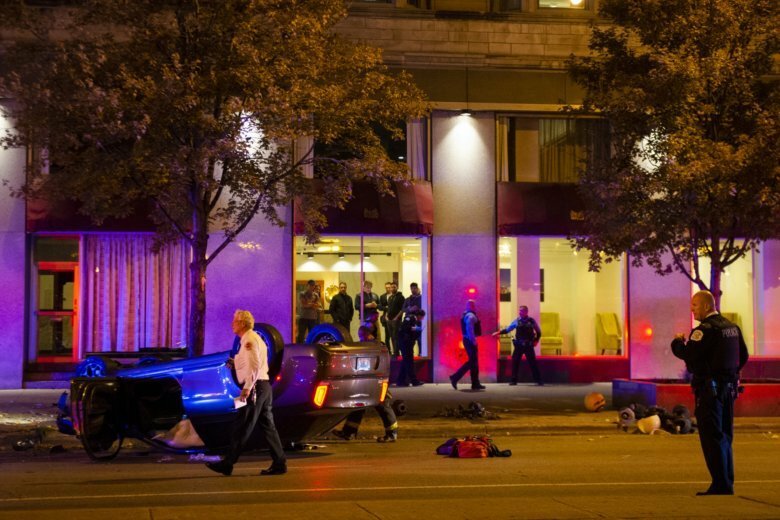 CHICAGO (AP) — Police say two men were fatally shot and two others were shot and wounded during a dispute inside a moving car that ended in a rollover crash in downtown Chicago. The shooting and crash happened around midnight Sunday. Police say five men were inside the car when the shots were fired. The driver was shot in the shoulder, lost control and crashed. Two wounded men ran to a nearby hotel, where security called police. Police say two men were pronounced dead at a hospital and two others are in stable condition. A fifth man is being treated for neck and back pain from the crash. Police say they have received conflicting information about what happened and are working to determine who fired the shots. Two weapons were recovered.